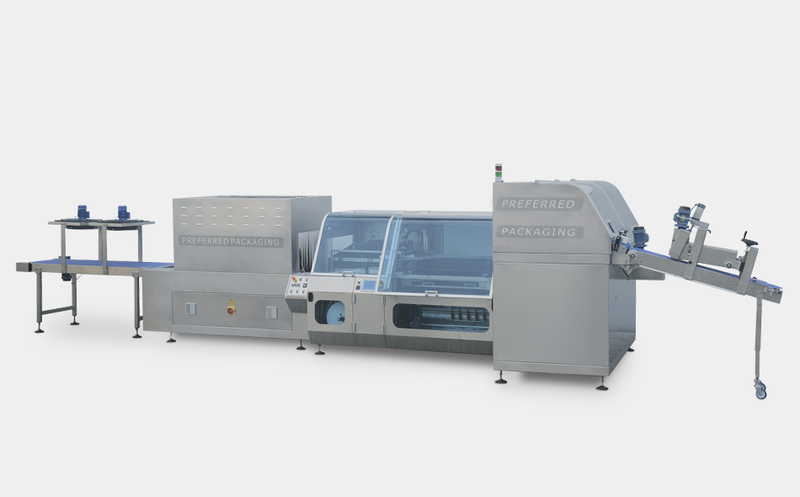 Complete packaging lines for every sector. We design, manufacture and create complete packaging lines for every sector: beverages, food, cosmetics, plastic, the “disposables” sector, tissue, toilet roll and Jumbo kitchen paper, the sanitary support sector, detergents, editorial, etc., offering our clients a turnkey solution that meets layout (space), speed (performance) and type of packaging needs. Complete lines with all systems required for packaging cosmetic products. High versatility of machine allows to pack different hygenic and cosmetic products. Perfect final result. For hygenic and cosmetic products of different size, types and format. Completely closed packaging, brilliant and tight, well alligned (if in group). Can work with all kind of film. Automatic transport and collation systems. Infinite modularity and composition of the machine DM PACK is specialized in studiyng and projection complete plants for cosmetic and hygenic products packaging personalized for each customer’s different factory configuration and output need. All DM PACK machines can be equipped with different types of infeed and outfeed conveyors, feeders (shuttle or rotary), shrink tunnels and many other accessories to form a complete line. Complete lines with all systems required for packaging candles products. High versatility of the machine allows to pack different candles types and sizes. Perfect final result. Packs single candles or collation of different format and sizes. With shrinking or no shrinking, film neutral or pre-printed. Final result is a completely closed pack, transparent and bright. Works will all kind of films, PVC included. Automatic collation and transport systems. Automatic tray or carton erection and feeding. Infinite modularity and composition of the machine DM PACK is specialized in studiyng and projection complete plants for candles packaging personalized for each customer’s different factory configuration and output need. Solution for the packaging of many different graphic products. Machine complete with all systems required for packaging graphics and promotional products. 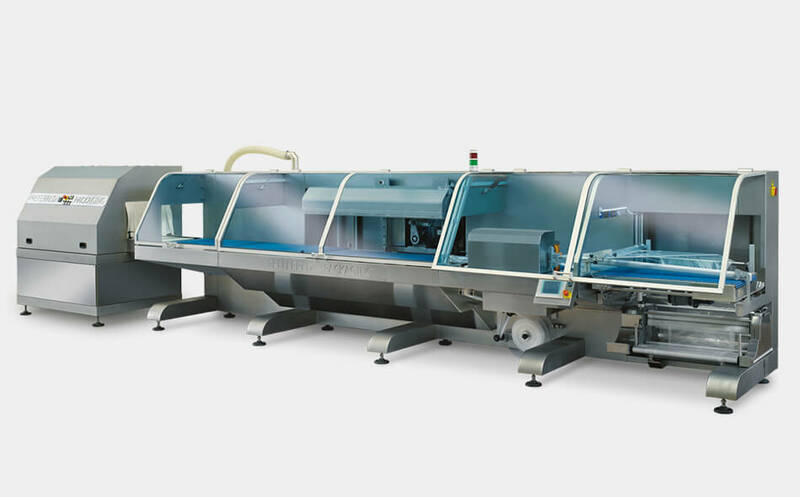 High versatility of the machine allows to pack different graphic products. Perfect final result. Our line can pack all types of graphics publishing and materials like catalogue, magazines, books, newspapers, etc… In the same machine the sealing bar can be changed into a double sealing bar that can create a bag provided with: handle, hole, euro slot; easy opening; open-close system; double sealing for magazines in pair. Shrink wrapped pack or very tight bag. 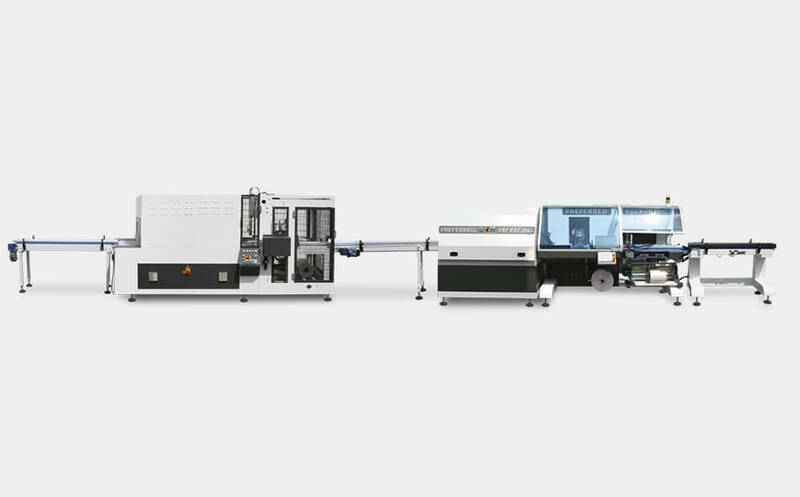 Infinite modularity and composition of the machine DM PACK is specialized in studiyng and protection complete plants for graphic products packaging personalized for each customer’s different factory configuration and output need. 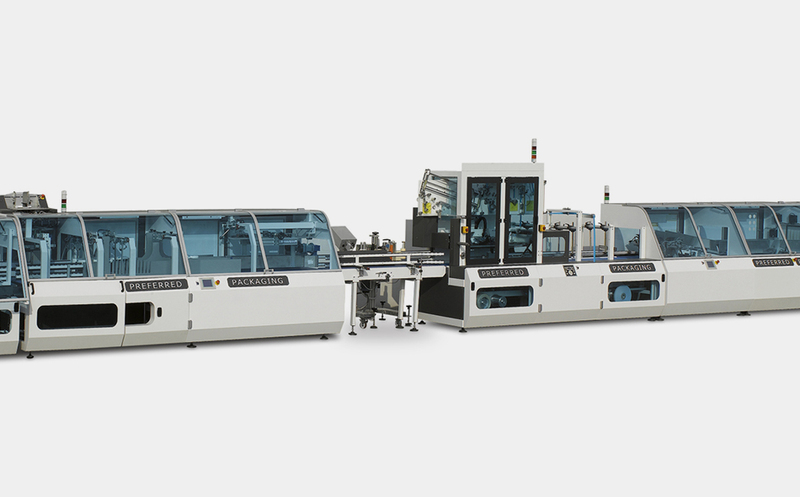 Complete lines with all systems required for packaging plastic products. Hight versatility of machine allows to pack different plastic products. Perfect final result. many different plastic products like dishes, trays, glasses, cups and many other for which we have also developed automatic loading and counting solutions as well as the automatic cartoning. The products can be packed single or in collection. All kind of films can be used. Film saving: no more than 1 cm of waste with our patented system. 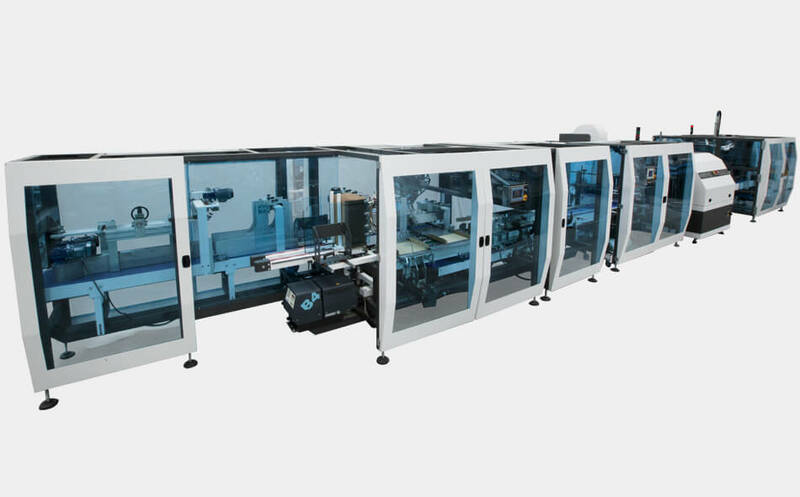 Automatic glasses counting or automatic collation/transport and cartoning systems. The stretch bundler machine is used to package products which cannot pass through a heat shrinkage tunnel and however need to be kept together, for example EPS sheets. Lines complete with all accessories required. 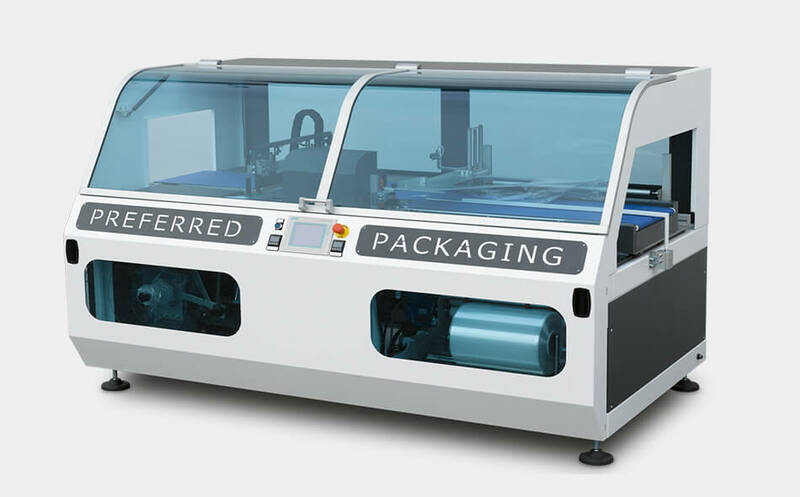 The huge versatility of the machine allows packaging of products with various dimensions and nature, without having to pass them through a heat shrinkage tunnel. The machine creates multipacks which, thanks to a heat shrinkage system, stay together and compact without passing through a heat shrinkage tunnel. Solution for the packaging of many different boxes of tissue. Complete lines with all systems required for packaging boxes of tissue and napkins. High versatility of the machine allows to pack different types and sizes of boxes of tissue and napkins.Perfect final result. Box of tissue or collation of different format and sizes. With shrinking or no shrinking, film neutral or pre-printed. Final result is a completely closed pack, transparent and bright. Works will all kind of films. 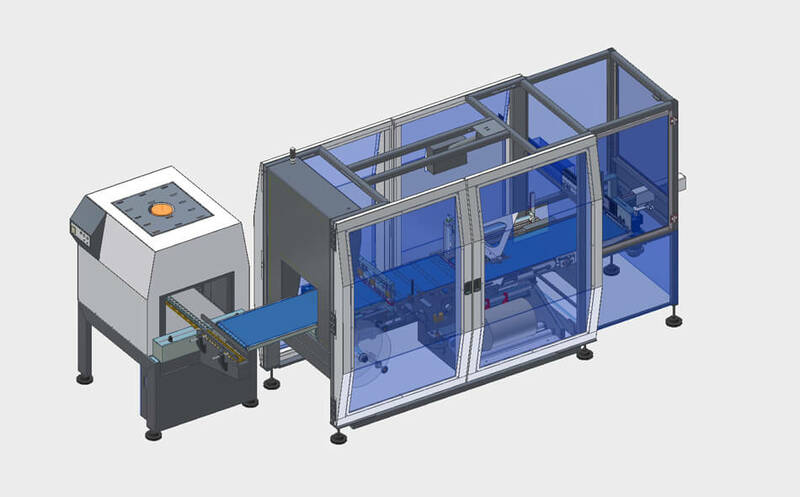 Automatic collation and transport systems. 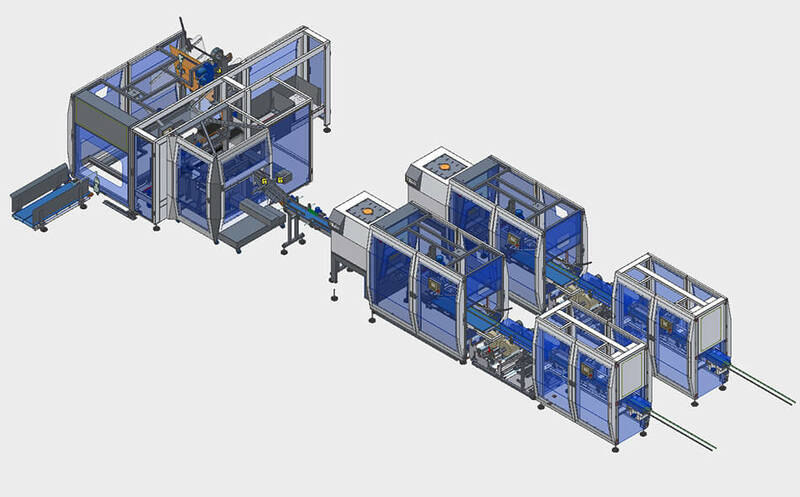 Automatic tray or carton erection and feeding..
Infinite modularity and composition of the machine DM PACK is specialized in studiyng and projection complete plants for boxes of tissue and napkins packaging personalized for each customer’s different factory configuration and output need. Complete lines with all system required for packaging away from home rolls, toilette paper and jumbo rolls of different sizes. Infinite modularity and composition of the machine DM PACK is specialized in studiyng and projection complete plants for home rolls, toilette paper and jumbo rolls packaging personalized for each customer’s different factory configuration and output need. Solution for the packaging laundry products with less costs. Complete lines with all systems required for packaging laundry and textile products. The versatility of the machine allows you to process the products of different sizes with a good result. sheet, towels, bedlinen, bedclothes, jeans, t-shirt and shirts, etc… Individually or in multipack. wrapped in shrink polyolefin or polyethylene shrink individually or in multipack. Final pack is completely closed to protect products from the dust. Infinite modularity and composition of the machine DM PACK is specialized in the study of plants complete with loading systems and automatic grouping for packaging. The solution for the packaging of different products in multipack shrink film. Replacing the expensive carton box. Complete lines with all systems required for packaging and collection of food multipack. The flexibility of the feeder allows you to process the products of different sizes with a good result and high speed. All types of envelopes containing frozen products and fresh products. The envelopes-bags can contain a food or not-food products. All these products can be collected, stacked and shrink wrapped. Multipack wrapped in shrink polyolefin or polyethylene shrink whit energy consumption saving, material cost and less maintenance. Infinite modularity and composition of the line. DM PACK is specialized in the study of plants complete with loading systems and automatic grouping for packaging multipacks. Complete lines with all systems required for packaging beverage products. High versatility allows to pack different products: bottles, cans, cartons, bricks. Perfect final result. Packs single products or collation of different format and sizes. With shrinking or no shrinking, film neutral or pre-printed. Final result is a completely closed pack, transparent and bright. Works will all kind of films. 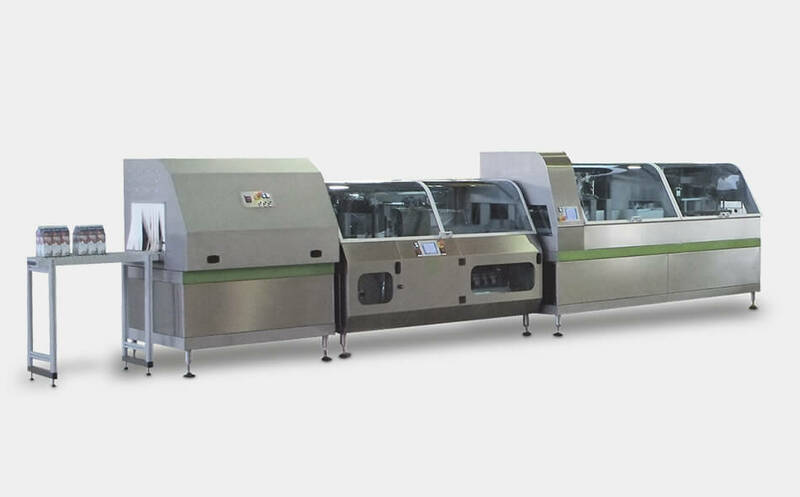 Automatic collation and transport systems. Automatic tray or carton erection and feeding. Infinite modularity and composition of the machine DM PACK is specialized in studiyng and projection complete plants for beverage products packaging personalized for each customer’s different factory configuration and output need. Complete lines with all systems required for packaging food products. High versatility of the machine allows to pack different food products. Perfect final result. 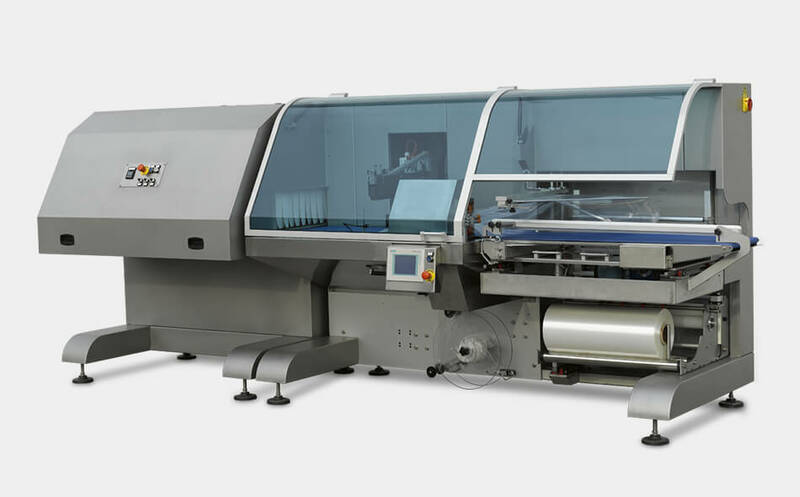 Our machines can produce different pakaging results; tight shrink wrapped packs, modified Atmosphere packs (to prolonge the product’s shelf life) and vacuum packs using different kind of films. Also BOPP and Barrier films with hermetic seal. Standard shrink and Wrapping, modified atmosphere (MAP) (film BOPP or film BDF), Vacuum Packaging. Canter level structure that allows an easy cleaning and accessibility of the machine, perfect in the Food Industry. Can be combined with a canter level shrink tunnel with opening chamber and canter level additional in feed belt. Complete lines with all systems required for packaging fruit and vegetable. 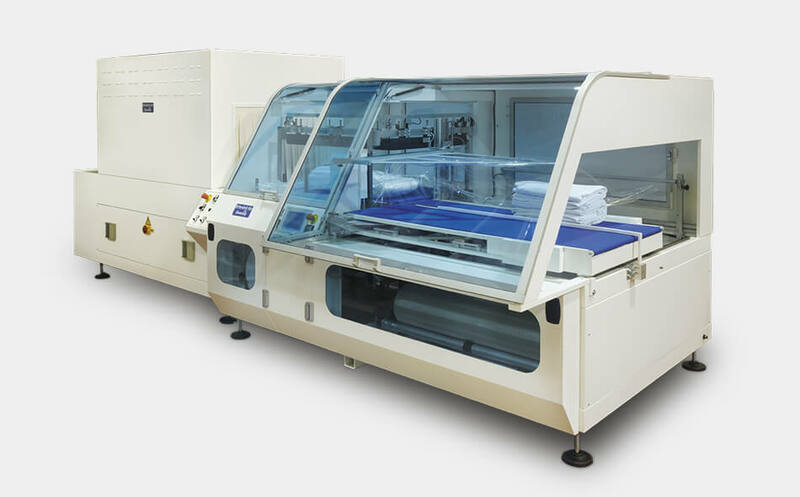 The first machine packaging flat and center folded film. tray, products without tray, boxes with shrinkable or non-shrinkable film, printed or neutral, center folded or flat film. All in the same machine. Clean result front and back, BRILLIANT and TRANSPARENT without film waste Poliolefine film used (instead of PVC). Film cost -20%. Recyclable film OXOBIO-DEGRADABLE. Longer film roll: less stop for film change. Infinite modularity and composition of the machine DM PACK is specialized in studiyng and projection complete plants for fruit and vegetable packaging personalized for each customer’s different factory configuration and output need. Complete lines with all systems required for vacuum packaging with vacuum chamber in line. High versatility of the machine allows to pack in vacuum different products, sizes in automatic using roll of film in line. 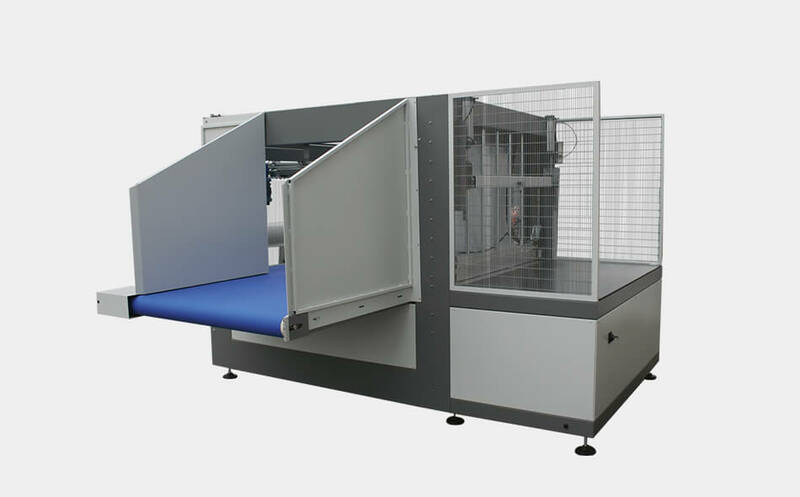 Automatic packaging vacuum machine working with flat or center fold roll of film. Innovation consist in using film roll instead of premade bags. More versatility in change of format and 40% of saving in the film cost. The only available machine able tho work in automatic in line with film roll and create a vacuum pack. Multiformat machine without rigid conformer, without premade bags. Food and non food products in vacuum packs: cheese in big and smaller pieces, meat, ham and salami, pizza and many other different products. Different configurations are available for different products sizes and speed. Center level structure that allows an easy clearing and accessibility of the machine, perfect in the Food Industry. Can be combined with a canter level shrink tunnel with opening chamber and canter level additional in feed belt. Packaging painted line, not stainless steel, for non-food products available. Complete lines with all the accessories required for the packaging and bundling of packs of coffee and boxes of sugar. 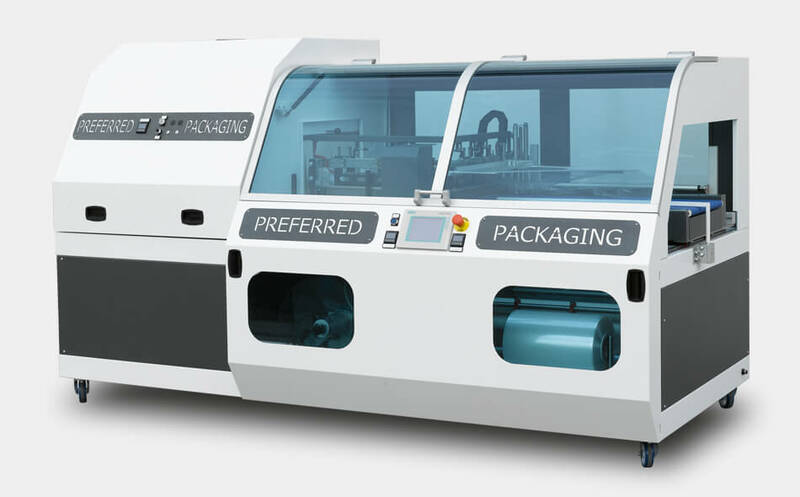 The flexibility of the line allow to automatically pack products of various sizes individually and then group them with a multipack former in a shrink wrapping or bundling machine. Products can be individually, packed them collected and packed again a bundling sleeve wrapper machine. Protect the individual package with shrink film. Form a multipack wrapped in polyethylene shrink or polyolefine shrink film. Infinite modularity and compositions of the line. DM PACK is specialized in the study of complete plants: loading systems and automatic grouping, for packaging multipack. Solution for the packaging of many different food bakery products. Complete lines with all systems required for packaging bakery products, fresh and frozen pizzas. 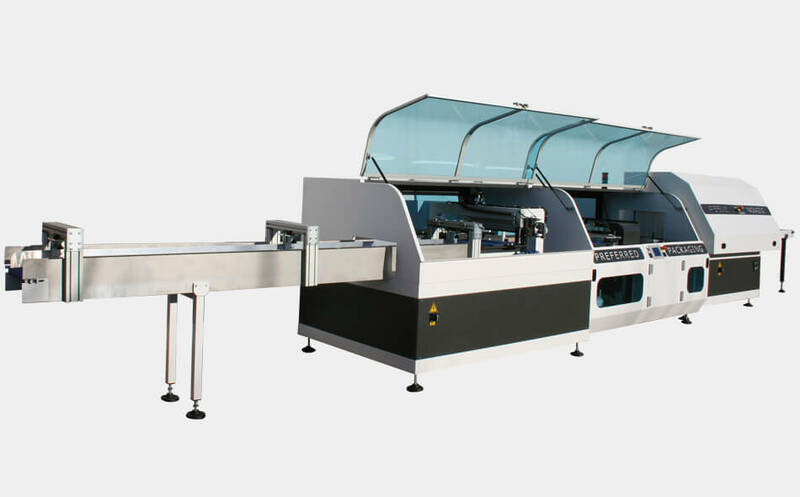 Complete packaging line with diverter, system to divide the pizza from its disk, cooling and refreshing conveyor packaging machine in protected atmosphere. pizza, bread, sandwiches fresh or frozen with shrink film and non-film printed or neutral, in a modified atmosphere MAP with barrier film. 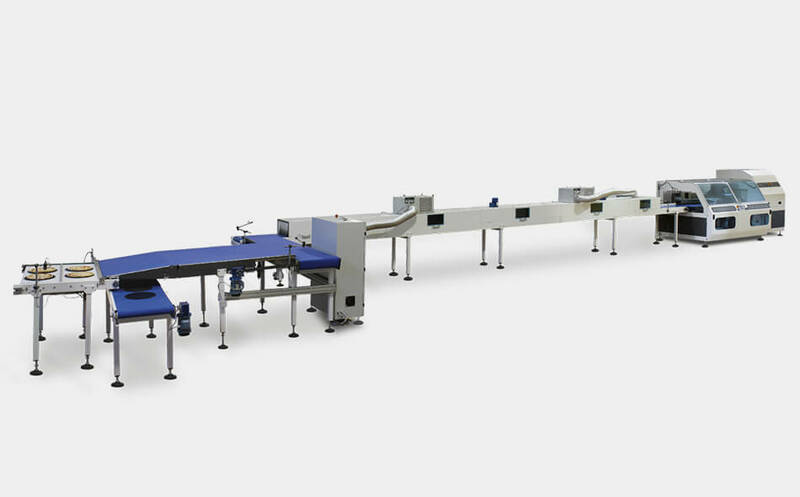 Complete packaging lines with diverter, system to divide the pizza from it’s disk, cooling and packaging. In the same wrapping machine it’s possible to pack both frozen products, with a simple polyolefin shrinkable film; and fresh products closing and sealing them with barrier films also in modified atmosphere. The packaging can be personalized using a pre printed film. Infinite modularity and composition of the machine DM PACK is specialized in studying and projection complete plants for pizza and bakery product packaging personalized for each customer’s different factory configuration and output need. The packaging solution for various types of multipack tin clusters. Line complete with all accessories required for the formation and packaging of heat-shrunk multipack clusters which are completed sealed. The huge versatility of the machine allows packaging of the various types and dimensions of product. Perfect result guaranteed. The machine can package many types of heat-shrunk multipacks with various dimensions and formations (2x4, 2x2, 1x4, etc.) with the possibility of using various types of heat shrinkage film: Polyolefin and Polyethylene.